Providing support for those with spina bifida and their families. 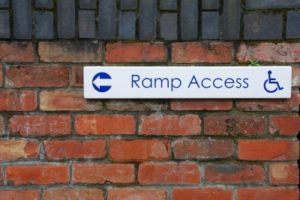 However, for people with limited mobility—especially those in wheelchairs—planning for a night on the town or a trip to the store can be a daunting proposition. Will the restaurant be accessible? How wide are the store aisles? What are the bathrooms like? A new website, http://accessa11y.org/, seeks to make it easier for those needing assistance to plan their outings. Through crowdsourced reviews, “Access Ally” provides vital information for those wanting to know more about the accessibility of local establishments. Business owners are encouraged to promote their retail stores and restaurants, and patrons are able to give their reviews of the sites. To learn more about the site, and to see a video tutorial on how to submit a review, click here. If you have any questions about the website, you can contact Chelsea Sullivan at csullivan@equalrightscenter.org or through the general website email at accessa11y@equalrightscenter.org. You can also follow them on Facebook, Twitter, and Instagram. Their Facebook link is https://www.facebook.com/AccessA11y/. Learn more about the work of SBANCA and stay up-to-date on upcoming events.